Obituary for Thomas Martin McCabe | Devlin-Rosmos-Kepp F.H. & C. S.
Thomas Martin McCabe of Phoenixville died Sunday of complications following a hip fracture. He was 88. He was the son of Eugene J. and Veronica Martin McCabe, also of Phoenixville, and was married for 62 years to Ethel Walker McCabe. A graduate of Phoenixville High School (Class of 1948), Mr. McCabe earned letters in football, basketball and track, and received the J. Elmer Gotwals award for football in 1947. Mr. McCabe had a distinguished military career, beginning with the Pennsylvania National Guard with B Company, 111th Regimental Combat Team, 28th Division, in which he served from 1947 to 1948. He enlisted in the United States Marine Corps in 1948, and served with the 11th Regiment, 1st Marine Division during the Korean War. He participated in the landing at Inchon, the first liberation of Seoul, and the Chosin Reservoir Campaign. He was commissioned a lieutenant from the rank of Sergeant in 1951, and was released from active duty as a captain in 1954. 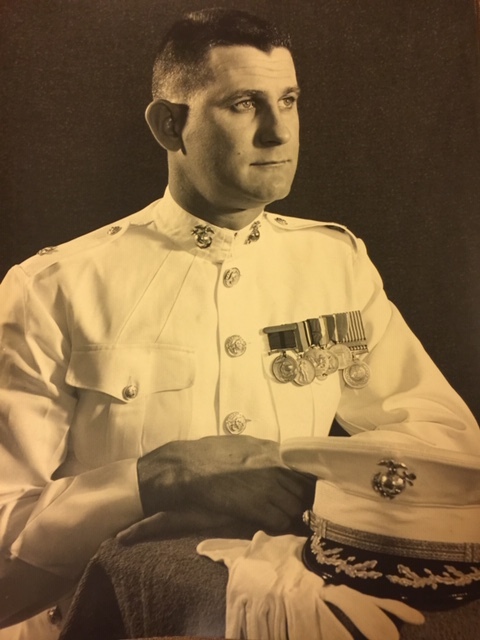 When his active duty ended, he continued to serve in the Marine Corps Reserve, in which he was promoted to colonel in 1972 and transferred to the Retired Reserve in 1981. He then reenlisted in the local National Guard as a sergeant, and retired as a master sergeant in 1991. He was a 1959 graduate of Ursinus College. While attending Ursinus, Mr. McCabe was employed as a patrolman by the Borough of Phoenixville Police Department. After graduation, he worked in Personnel and Labor Relations. Before retiring in 2004, he was employed for 15 years as the maintenance repairman for the Spring City National Guard Armory. During his tenure at the Armory, he founded and later served as curator for the Regimental Museum, which remained a lifelong passion. He was an avid collector of military memorabilia and restored several military vehicles. He was a member of the Greater Pennsylvania Military Vehicle Historical Association, the Veterans of Foreign Wars, the First Marine Division Association, the Kimberton Fish and Game Association, and the National Rifle Association. Mr. McCabe was also active in service and volunteer organizations. He was involved in scouting since 1943. He received both his Eagle rank and Bronze Palm in 1945 as a member of Troop 58. He was a Vigil member of the Order of the Arrow, a member of the Troop Committee of Troop 56, and a member of the Camp Horseshoe Alumni Association. He served on the Phoenixville Police Commission, as a local and state Democratic Committeeman, and as a School Board Director. He was a past President of the Philadelphia Marine Corps Reserve Officers Association. He is survived by his son, Thomas R. McCabe and wife Marleen of Burke VA; two daughters, Patricia Davis and husband David Bennett of Springfield PA and Maureen “Sally” McCabe and husband Stanley Pokras of Philadelphia; foster son Michael Ayres and wife Margaret of Norristown; four grandchildren, four foster grandchildren, and a great grandson. In lieu of flowers contributions may be made to St. Mary's Franciscan Shelter, 209 Emmett Street, Phoenixville, PA 19460.